Scientists have discovered how the disease impairs key cells of the immune system, leaving patients prone to repeated lung infections caused by bacteria such as pneumonia.Treatments that boost the antibacterial functions of these key cells could help to reduce the number of chest infections experienced by patients and improve their quality of life, researchers say. 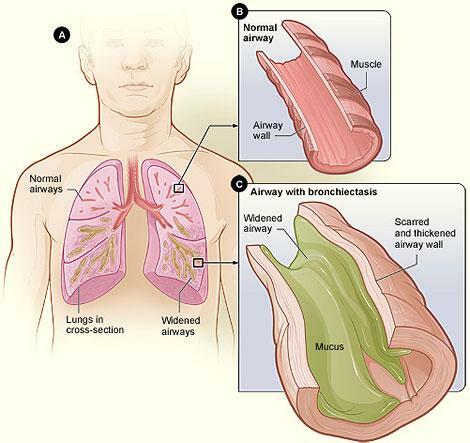 The condition – called bronchiectasis – is associated with a vicious cycle of bacterial infection and inflammation in the airways and lungs. In healthy people, inflammation helps to clear infections but in patients with bronchiectasis, this process is not effective. This leads to further inflammation, which can instead damage the airways, leaving patients even more vulnerable to infections and causing even more inflammation. The team from the University of Edinburgh focused on cells called neutrophils, which are the body’s first line of defence against infections. Patients with bronchiectasis have an excess of neutrophils in their airways compared with healthy people, so it was not understood why they are prone to repeated infections. The researchers found that neutrophils from patients with bronchiectasis do not behave in the same way as those from healthy people – the neutrophils live longer, are more activated and have altered functions. These cells were unable to kill bacteria as effectively as those from healthy people. This was worse during a new infection, and may help explain why patients were not able to clear bacteria from their body. The study involved 18 patients with bronchiectasis, eight healthy volunteers and six pneumonia patients with no background lung disease. The researchers say the findings warrant further investigation of how neutrophil function could be improved in bronchiectasis patients, and whether this could help stop the cycle of infections. Around one in 1000 people in the UK are affected by bronchiectasis, which can be life-threatening. Patients experience symptoms including shortness of breath, chronic coughing and excessive phlegm production. The study, published in the American Journal of Respiratory and Critical Care Medicine, was funded by the Chief Scientist Office of the Scottish Government and the UK Medical Research Council.